DU Cut off 2018 Released -Check Delhi University (DU) Fourth Cutoff List Now! Delhi University Cut Off 2018: DU 4th Cut Off 2018 is being released today i.e on July 05, 2018. Check here the DU 4th Cut Off 2018 PDF college wise as they announce one by one.DU Third Cut Off for some college has been released. Candidates can check live updates of Third Cut Off here. Delhi University has released the Second Cut Off on 25th June 2018 at du.ac.in. The DU First Cut Off 2018 was released on 18th June 2018. Candidates can check the details regarding the DU Second Cut Off 2018 here. The Admission Process for First Cut Off was finished on Thursday. As per the latest records, the University Official said that out of over 56, 000 seats over 11, 000 seats were filled which is a record breaking number. Last year, 2000 seats were filled in the First cut off. Delhi University has released DU first cutoff on 19th June 2018. The University will first release the DU First Cut off and then the rest cutoffs. The UG programme admission will be based on the basis of entrance exam & merit list. The cut-off will be released through online mode for various rounds. The Cut-off is the minimum marks that a candidate must score in the 12th Board Exams as to secure admissions in DU Colleges for UG Courses for the academic session 2018-19. DU Cut off 2018 is calculated on the basis of the Percentage Calculation of the Best Four Subjects in DU. Although 30 June is the official date for DU Third Cut Off 2018, the college wise lists are being published on 29 June. Candidates can check DU Cut Off 2018 here as they come. Heartiest congratulations to those who clear cutoffs. However, those who do not, should also not lose spirits. DU publishes around 8-10 cutoffs. 06:25 PM: Shyam Lal College (Evening) has released the third cut off list for DU Admission 2018. Check here. 06:20 PM: Acharya Narendra Dev College has released the third cut off list for DU Admission 2018. Check here. 06:15 PM: Zakir Husain P.G. Evening College has released the third cut off list for DU Admission 2018. Check here. 06:10 PM: Shaheed Sukhdev College of Business Studies has released the third cut off list for DU Admission 2018. Check here. 06:00 PM: PGDAV College has released the third cut off list for DU Admission 2018. Check here. 05:55 PM: Satyawati College (Evening) has released the third cut off list for DU Admission 2018. Check here. 05:50 PM: Janaki Devi Memorial College has released the third cut off list for DU Admission 2018. Check here. 05:45 PM: Hindu College has released the third cut off list for DU Admission 2018. Check here. 05:40 PM: Deshbandhu College has released the third cut off list for DU Admission 2018. Check here. 05:35 PM: Kirorimal College has released the third cut off list for DU Admission 2018. Check here. 05:30 PM: Zakir Husain College has released the third cut off list for DU Admission 2018. Check here. 05:25 PM: Aryabhatta College has released the third cut off list for DU Admission 2018. Check here. 05:20 PM: Dyal Singh Evening College has released the third cut off list for DU Admission 2018. Check here. 05:15 PM: Vivekananda College has released the third cut off list for DU Admission 2018. Check here. 05:05 PM: Shaheed Bhagat Singh College (Evening) has released the third cut off list for DU Admission 2018. Check here. 05:00 PM: Maharaja Agrasen College has released the third cut off list for DU Admission 2018. Check here. 04:50 PM: Jesus & Mary College has released the third cut off list for DU Admission 2018. Check here. 03:50 PM: Satyawati College has released the third cut off list for DU Admission 2018. Check here. 03:45 PM: Sri Aurobindo College (Evening) has released the third cut off list for DU Admission 2018. Check here. 03:25 PM: Shri Ram College of Commerce (SRCC) has released the third cut off list for DU Admission 2018. Check Here. 03:20 PM: Ramjas College has released the third cut off list for DU Admission 2018. Check here. 01:00 PM: PGDAV College (Evening) has released the third cut off list for DU Admission 2018. Check here. 12:35 PM: Shaheed Bhagat Singh College (SBSC) has released the third cut off list for DU Admission 2018. Check here. 12:00 PM: We have started checking official websites of Delhi University colleges. As soon as any college releases DU Third Cut Off 2018, we will publish it here. Shaheed Bhagat Singh also released its first cut-off lists. To check the Cut Off Lists Click here. DU Cut Off to be Released Early – According to Media Reports Delhi University will release the Cut Offs today i.e. 18th June, 2018. Earlier the Cut offs for Arts, Science and Commerce courses is scheduled to be released on 19th June 2018. A total of 2, 78, 544 candidates have applied for DU Admissions this year including the payment of the application fees. The number of registration has been increased by 21% as compared to the last year. More than 85% of the applicants are from CBSE Board out of which 48% of the candidates are female. Students who have applied under the Sports Quota, to provisionally participate in Sport Trials will commence from 18th June 2018. The List of the Applicants who have applied under the Sports Quota have been displayed on the Official Portal of Delhi University. The University of Delhi conducts its own entrance examination for providing admissions. The shortlisting of the candidates will be on the basis of the Entrance Examination and the Merit List. According to DU Admission 2018 Schedule, the cut off will be released online in various rounds. Delhi University will release 5 cut off rounds for the UG Admissions this year. We will update here as soon as DU releases the Cut Off 2018. We will update DU Cut Off 2018 in an easy way so that the candidates can view the cut offs of all the courses and colleges in an easy way. Students have to visit the respective colleges with their documents for verification as well as for the College Admission. 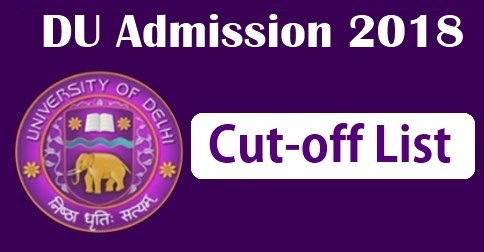 The University of Delhi will release DU cut off 2018 from 19th June 2018. Delhi University releases five cut off lists. The Classes for UG Courses will start from 20th July 2018. The term “Against Cancellation” states that the college does not have any vacant seats at the time of the announcement of the cut off but if any student wants to cancel their admission due to any reason and the seat becomes vacant, the other students will be offered a seat. The Applicants can not take admissions in two different programmes simultaneously or same programmes in different colleges after the release of Delhi University Cut- Off 2018. If in case, you take admissions at two places, your admission will be canceled from both the colleges/ programmes. Delhi University will start releasing the Cut Off sessions from third week of June 2018. The First cut off will be released on 19th June 2018. However, DU has proposed to release five cut off sessions but the number of cut offs could be more. The Applicants are required to produce their original certificates and documents along with two self-attested copies of the documents and certificates. These documents and certificates have to be submitted at the time of the Admission and the release of DU First Cut off 2018. The University will be accepting the self-attested copies of the documents of the candidates below. OBC (Non-Creamy Layer) Certificate (in the name of the applicant) as in the central list. Transfer Certificate from School/College as well as Migration Certificate from Board/University is required for the students who have passed out their senior secondary exam outside Delhi. Minority Certificate for the Admission in Minority Colleges. The Highest Cut Off of Ramjas College was 98. 75 followed by the Hindu College and Lady Shri Ram College for Women at 97.5 percent. Mata Sundari College for Women has the Lowest Percentage in the first cut off for the General Category at 90 percent. Ramjas College has the highest cut off among all the subjects and colleges with 99.25 percent. Ramjas College and Kalindi College had the highest first cut off for the General Category at 98.5 percent, followed by the Hindu College at 97.75 percent. The Lowest in the first list of the BA (Hons) Economics was 94 percent by Shyam Lal and Kalindi College. LGBT Khalsa had the highest cut off at 95. 27 percent followed by Sri Ram College for Women who had a cut off of 96.75 percent. Bhagini Nivedita College Cut- Off for B. A Programme was as low as 68 percent. Once DU Cutoff is released, Log into the Registered Account and check whether you have made into the cut off List or not. Select the desired combination and take the printout of the admission form. Report to the College with the Application Form. Make sure that you carry all the original and self-attested (photocopies) documents. After the completion of the registration procedure, an acknowledgment receipt will be given to the candidate which has to be carried by the candidate along with the Online Form Payment Slip. 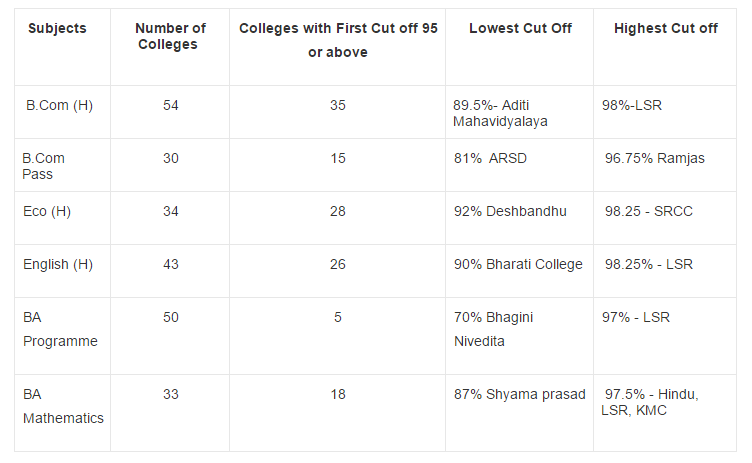 DU cut off Marks have declined from the range of 0.25 to 5.0 percentage points from the fourth cut off. For General Students, the fifth (last) list for this session still offers admissions in popular courses of Bachelor of Science (BSc) (Hons) Maths, Bachelor of Commerce (BCom) (Hons) in 23, 27, and 38 Colleges respectively. It was also reported that the applicants from Tamil Nadu only secured 80 percent of the seats in the top colleges. Delhi University will release the DU first cutoff on 19th June 2018. The cutoff lists will be available online for the respective colleges. Candidates must visit the website frequently to get the daily updates. The University of Delhi will start its admission process from 19th June 2018 (for UG Courses) and 27th June 2018 (for PG Courses). The DU Counseling will be organized through Offline mode. In this article, we will provide complete details regarding the Delhi University Counseling Schedule 2018. After the declaration of the Delhi University Admission DU Cut Off Lists by the University, candidates have to report to the college of his/her choice as per the schedule of the DU Admission. Here the candidates, have to fill in the college form and the University Enrollment Form. Then the documents of the candidates will be verified and submitted and the payment of the admission fees is done. If the candidates name is not available in the first cut-off list of any of the DU affiliated colleges then, they could be considered in the next upcoming list. So the candidates are requested to check the cut-off lists as soon as it is available on the desired college website. The Cut-Off lists are very important for each and every candidate as it decides the future of the candidate. The cut-off is the minimum number of marks that is secured in the XII Board Examination that is allow a candidate to get a seat in his/her desired college. The cut-off mark is the limited bar/set decided by the College or the University to offer admission. If a candidate secures more than the cut-off mark or exact to the cut-off marks that means that the candidate is selected/ qualified. Below the cut-off marks states that the candidate is not qualified.